Alabama’s premier political journalist and commentator. “Inside the Statehouse with Steve Flowers” is Alabama’s leading political column. It is published in 72 Alabama newspapers weekly and has a circulation approaching 400,000. Having served 16 years in the Alabama State Legislature, Steve brings a unique perspective to Alabama politics. “Inside the Statehouse with Steve Flowers” covers the state political scene each week in an entertaining and informative fashion. The weekly column also takes its readers down “Memory Lane” with Alabama’s rich and colorful political history. April 24, 2019 – Who will take Doug Jones out next year? In addition to his weekly newspaper column, Steve Flowers brings his expertise to radio and television shows throughout the state. “This Week in Alabama Politics” is a 10 minute weekly show produced by Troy University television. 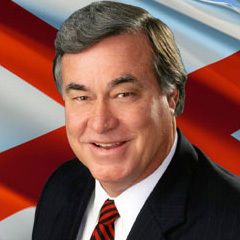 His 30 minute show, “Alabama Politics” features statewide political figures and can be viewed every Thursday and Friday night on public television. Alabama Politics can be viewed in Montgomery and Autauga County viewing areas Monday through Friday at 7:30 A.M. and 10:00 P.M. on channels 43 and 96. Steve also appears regularly on Montgomery television station, WAKA, CBS 8 as their political analyst. Steve’s radio show, “This Week in Alabama Politics”, is aired every Saturday at 4:35 on TROY Public Radio. It is also syndicated statewide and can be heard over 21 commercial stations throughout the state. The new book from Steve Flowers, Of Goats and Governors – Six Decades of Colorful Alabama Political Stories, is now available for sale. It will be enjoyable reading for anyone interested in Alabama political history. The book is published by NewSouth Books, an independent publishing house specializing in regional books of national interest.